Wendy and I at the 2013 PIGS rally with Nathan-3 and Zoe-1 My wife and I (Michael and Wendy Riley) recently accepted responsibility for the Paired Iowa’s Going Somewhere (on tandem bicycles) website content. We thought it could use a ‘getting started’ page – an introduction for those considering the idea purchasing a tandem or those who have a tandem and want to share the joy with others. We are also hoping this page might encourage younger folks as well to join the PIGS club as tandem riding is a sport for all ages. Why we picked up tandem riding? I enjoyed biking as a kid and biking around Ames Iowa while at college. I got busy with my first job and put the bike down for several years after college. After finally getting married at the age of 26 in 2006 I started to bike some with my new bride. It was not until our first son Isaiah was born that I really got an itch to start biking more seriously. Part of that motivation stemmed from the fact I had switched jobs from working for a church with an active life working on building projects and ministering to college aged kids to a traditional desk job as a Software Engineer. My waist line and weight were showing signs of the changes; I wanted biking to become an exercise opportunity as well as an opportunity to spend time with my wife and child. We purchased a quality bike trailer/jogging stroller and started taking long walks when Isaiah was small and started biking once he was large enough to sit up and wear an infant helmet. We lived near a 3 mile loop recreational trail. Because the trail is very popular and always busy on nice days, it was impossible for my wife and I to bike side-by-side to talk while biking. In addition, it is not always the safest to ride side-by-side on a street. This was the first not fun part to biking as a couple – no consistent ability to interact and communicate. The second problem was that the parent who towed the child did all the work. This was problematic in the sense we wanted to use biking as a form of exercise and the one parent who wasn’t towing wasn’t getting any exercise. Thankfully there had been two occasions when we were biking on the trail that we saw a couple come and bike the loop on their tandem. That got the engineering gears in my mind turning out the idea that, there’s a better way to this towing a child and conversing with your wife while biking dilemma. Sheldon Brown explains how a tandem works (something I needed for my engineering mind). But the Santana website does a great and the best job explaining the tandem riding benefits and experience. After a few thousand miles on a tandem and several thousand miles towing small children, I find that their point on the ‘World in a Better Light’ is entirely true and accurate. And as odd as it might seem, riding a tandem or a single seat bike towing children (especially when always riding with the safely flag prominently showing) – commands more road respect from motorists. 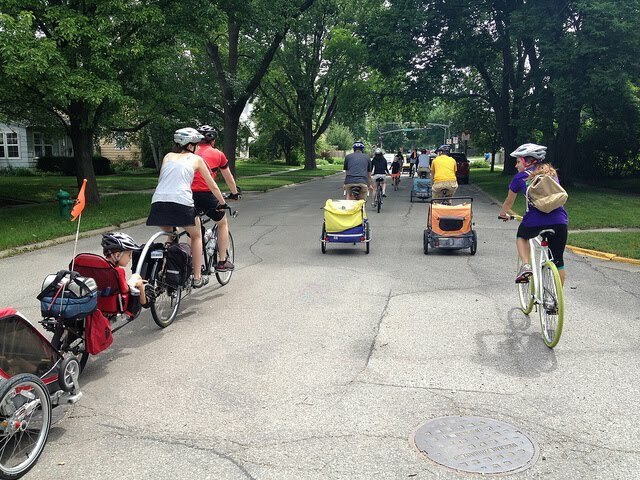 I found early on when riding tandem or towing children I felt safer on the road. And just so this isn’t a shameless pitch for Santana, I included a Co-motion article – which did help me get my price expectations set; though it was the Santana website that sold me on wanting to buy a tandem. After learning a shop quality tandem (Trek or Cannondale) costs between $1,100 and $2,200 it became evident that a good starter tandem isn’t simply the cost of two single seat bikes. Thankfully our local bike shop had connections with the Des Moines market and had a used Trek T100 for sale. The bike shop owner, who also tandem rides with his wife, let us test ride it towing Isaiah. After our 5+ mile test ride, I was sold. Purchasing the bike seemed like financial stretch at first, (the bike used was still $1,100 but nicer and better fit for my taller wife than the new $1,100 model) but it is one of those few purchases where I have zero buyers’ remorse. I will say my wife wasn't entirely sold on the tandem idea at first, and I had to use some level of persuasion to get her to test ride one and then buy it. I am very thankful she followed my leading here, learned how to ride and work as a team and now it’s her favorite bike. A bike where she can enjoy the view, exercise and talk with me and not have to worry about steering, shifting or braking. Riding a tandem helps us communicate and work as a team – an experience I would not trade for anything and looking back, a few thousand dollars is worth all the investment in our marriage and time together. My wife and I got several hundred miles in during our first two years owning the tandem, most of those miles in the first. Our second son Nathan was born in early 2010 so that killed most of our family biking as he was too small to safely ride while being towed by a bike (though I put several hundred on my single seat bike). When 2011 rolled around Wendy wanted to have a 2011 fitness goal. Obviously the goal had to include an eleven so she took me up on my idea we could do 1,100 miles. It was at this time we also wanted to ride with others. We joined a local bike club that biked every Wednesday evening and also found the PIGS website. Our first PIGS rally was in 2011. Despite the very strong winds that year, it was great to ride with other couples who love riding tandem and see riders in all age ranges: 30’s – 70s and beyond. It was very reassuring to know we have picked a sport we can do together for the life of our marriage. I am here to encourage you to do the tandem research and then find a bike shop where you can try one yourself. If the points made by the Santana website make you think, "Yeah, tandem riding could be for us too", you probably have nothing to lose by trying it out. At first we were very doubtful we could reach our 1,100 mile goal, but working together made all the difference and converted the goal into a reality we are very proud of. You too will enjoy working together and having adventures with your life partner.